"To Amy Lowell" by Eunice Tietjens is the Songs of Eretz Poem of the Day and the offering from Poets.org's Poem-A-Day for April 12, 2014. The poem was published in 1919 in Tietjens' collection, Body and Raiment, and is, therefore, in the public domain and legally and conveniently reprinted here. Eunice Tietjens (1884 - 1944) (pictured right) was a poet, novelist, editor, and wartime newspaper correspondent. A major figure of the Chicago Renaissance, she published four collections of poetry. 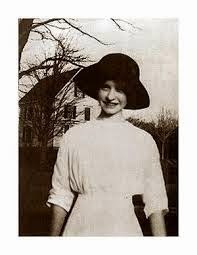 Reference to this and additional biographical information may be found here: http://www.poetryfoundation.org/bio/eunice-tietjens. Amy Lowell (1874 - 1925) (pictured left) was a contemporary of Tietjen. 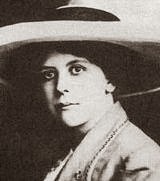 Biographical information and reviews of her poetry may be found in Songs of Eretz here: http://eretzsongs.blogspot.com/2014/02/review-of-poetry-by-amy-lowell.html and here: http://eretzsongs.blogspot.com/2013/02/review-of-letter-by-amy-lowell.html. As a major proponent of the Imagist Movement, Amy Lowell no doubt would have been pleased by this poem. It contains a simple conceit, and creates hard, crisp, clear images. In addition to the obvious nautical images, the image of sails in the first line evokes the image of hospital sheets later in the poem. The poetic license Tietjens used by coining the word "straitly" is brilliant. As an invalid in a hospital, Tietjen was certainly in dire "straits." She perhaps lay rigidly "straight" in her bed, racked with pain. And of course, there is the obvious "strait," as in a narrow passage of water, that flows around the hospital-white island of her pain.